America’s favorite off-road brand promises to launch no less than 10 new or refreshed models, and to bring back the Wagoneer nameplate. While Michael Manley, head of Jeep and Ram brands, believes electrification will reduce the margins of automakers in the foreseeable future, this is the technology on focus for the American off-road icon in its next five-year strategic plan. Today, Jeep has announced it will launch two new products each year from now until 2022, and will have 10 PHEVs and four battery-electric vehicles by that year. 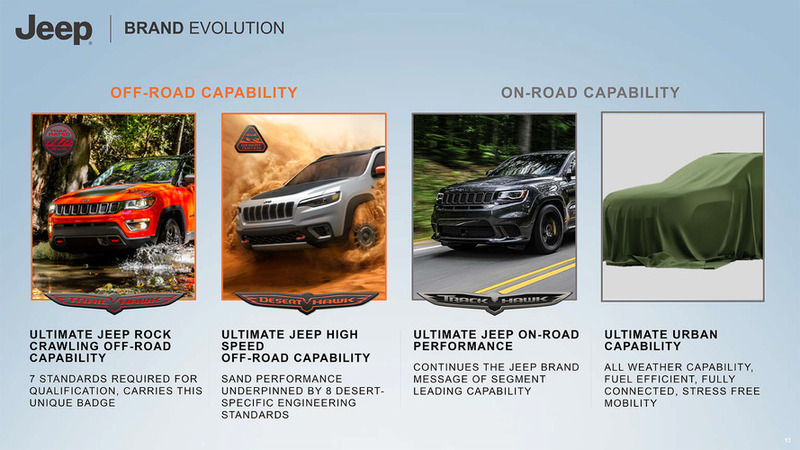 One slide of the company’s presentation (below) hinted that more off-road-oriented Cherokee Deserthawk was also on the way. Jeep would gear it towards performing well in sand, rather than the rock-crawling Trailhawk variants. Electrification will play a major role in the future of the company, which wants to offer its customers an electrification variant of its every model by 2021. Approximately at the same time, Jeep will also introduce Level 3 autonomous technologies. Diesel engines are said to be gradually dropped from the brand’s lineup, but there’s no actual timetable for that intention. Sometime between now and 2022, Jeep will launch a new generation Renegade and an all-electric Wrangler. Another small crossover, positioned below the Renegade, will also join the family at some point, while the Compass will receive a mid-cycle refresh. At large, Jeep wants to enter three new segments with brand new or well-forgotten products. The marque promises to launch a pickup truck and a three-row E-segment large SUV, and to bring back to life the Wagoneer and Grand Wagoneer duo. In addition to the new models, Jeep, with the booming SUV and crossover sectors in mind, will also invest heavily in increased production capacities. The brand’s dealer network will also be expanded. Jeep will work not only on the off-road capabilities of its future vehicle, but also on their on-road performance. The company wants to eventually create what seems to be perfect everyday car, offering all weather capability, high fuel efficiency, and stress free mobility. Jeep’s future urban utility vehicles should combine the advantages of both SUVs and cars. 11 Comments on "Jeep 2018-2022 Roadmap Reveals 8 PHEVs, Diesels Dead"
How is that different from a HEV? I think the distinction is that a mild hybrid can’t move without the engine on. It’s more than just stop/start because the electric system does at least provide traction power. It will be interesting to see how they implement traction control on an all electric wrangler….precise control of each wheel spin and torque could do some cool things with offroad and rock crawl traction performance…. The main market driver (as shown in their presentation) is compliance. So I would not expect to see much of their BEV/PHEVs outside China and Maybe the ZEV states in the US. This could be the ultimate off-road vehicle given Jeep’s robust heritage + low speed torque + no minimum “engine” speed + independent control of torque for each wheel. I guess some launches include more than one vehicle since ((10+4)/(2022-2018)) / 2 = 1.75 vehicles per launch average. And most if not all of these are already in development given the window is less than 5 years. Its good Jeep is dropping Diesels, sooner the better. Toyota dropped RAV-4 Diesel in Europe. nope they don’t know and dont care. most need the performance of diesel, driving range and pulling torque. most are annoyed by the emission controls, because they raise cost/complexity and reduce fuel economy, but there is no alternative if you need to pull a load a long distance.